The occasion, time (5th October 1910) and location (Euston) are all known. The engine is an unidentified Precursor. The question is did the LNWR often run trains where the engine was so highly decorated? The answer to your question has to be no. All the flags and plaques are much too clean. There are no tears or flies. Even in 1910 good old common sense would prevail and not allow it. What would today�s HSE think? This is definitely a staged photograph. I don't know how often they decorated their engines but the Euston occasion wasn't unprecedented. The inaugural train on the "missing link" between Brynmawr and Nantyglo featured a beautifully clean and highly decorated coal tank (no. 2458) running bunker first from Brynmawr. See Tasker, Merthyr, Tredegar & Abergavenny and Branches page 35. 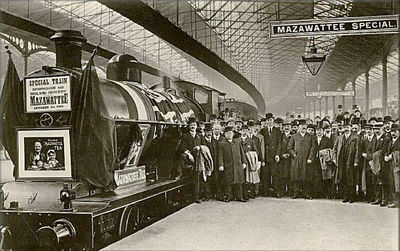 I believe this may be a train sitting at Paddington which had been chartered by John Lane Densham chairman of the Mazawattee Tea Co. It was chartered for a visit of French delegates of the Federation of Grocers Association to an Anglo French Conference. Following visits to the Company premises at New Cross and lunch they were conveyed to Paddington where they then travelled by this special train to Windsor and following a visit to the Castle and having tea they travelled back to Paddington. Sorry, Megan, but this train isn’t the one you found described in ‘The Taunton Courier’ and ‘The Western Gazette’, because the visible details of the station show that the location is definitely Euston. The train is standing at Arrival Platform No 1, looking north with the buffer stops not far to the left behind the camera. The Special Train headboard on the front of the engine has a date which reads “October 5th 1910” and I suppose that the train has recently arrived from Birmingham; the flags etc were then added and the group photo taken. “MAZAWATTEE SPECIAL” (top right) seems to have been added in the photographer’s studio on the hanging “No 1 PLATFORM” board.